At Tommy Ward’s corn and soybean fields in West Kentucky, they’re eating up plants and rooting around on hillsides, creating washing and digging wallows. In south central Kentucky, Rod Wolford had to resort to electric fencing to protect his produce crops after the animals started tearing up pastures. In north central Kentucky, cattle farmer Randy Kelly has a herd of 25 to 30 at a time come through and tear up his fields. The “trouble” is wild hogs. Once confined to a couple of counties in extreme southeastern Kentucky, wild hogs have spread across the state over the last two decades, thanks to help from humans (mostly hunters). As a result, farmers are battling to protect their crops, pastures and livestock from the invaders. Meanwhile, officials with the state Department of Fish and Wildlife Resources are trying to send them all to hog heaven because of the damage to native wildlife and ecosystems. “Our goal is complete eradication,” said Chad Soard, wildlife biologist with the department. Related to the Eurasian wild boar and descended from domestic stock released, sometimes deliberately, sometimes accidentally, over the last three centuries in North America, wild hogs are hardy and prolific. Omnivores, wild hogs will eat nearly anything from roots and tender plants to mast on the forest floor, even eggs and young birds. A sow can have two litters a year, averaging three to eight piglets per litter. The piglets hit sexual maturity at a mere six months of age. Boars can reach mature weights of 400 pounds or more. They feed mostly at night, making control that much more difficult. Yet populations of wild pigs in Kentucky had remained small and isolated in the southeastern mountains until the 1990s, when the department started getting reports of hog damage in other parts of the state. Soard blames hunters, who illegally caught and transported hogs from other states, for the spread across the state. “When you see populations stay isolated for hundreds of years in a couple of counties, like some were in Florida, and then all of a sudden they are all over the place, it tells you humans are moving them,” Soard said. Soard said the hogs, smart and wary, are popular with hunters who use often dogs to run the animals or shoot them from stands. Some are killed for meat while others, caught alive with dogs, are transported to game preserves. “Selling hogs to game preserves can be lucrative, unfortunately,” Soard said. In western Kentucky, Ward said he heard that the hogs that bedevil him originally came from Arkansas and Louisiana, brought in by local hunters. Kelly said in his county the hogs are likely descendants of domestic stock that had been released by a local farmer who was getting out of the business. He said he has seen a sow with eight piglets on his farm that was red and black spotted, while most hogs that have been feral for many generations are all black. Soard said the department does not have an estimate of how many are in the state. To address the influx of these pesky pigs, the General Assembly just passed a bill from Reps. Steven Rudy of Paducah and Fred Nesler of Mayfield that sets penalties for releasing the animals into the wild. KFB supported the measure. 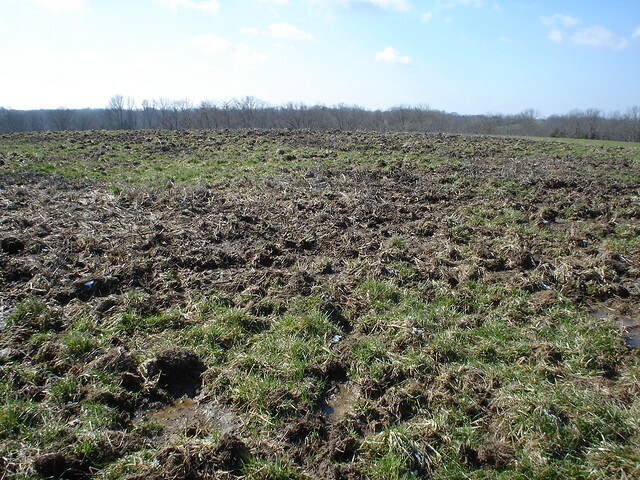 While farmers deal with threats to their cropland, wildlife takes a direct hit, Soard said. “They go through the land like a vacuum cleaner,” he said. The pigs devouring hickory nuts and acorns remove food sources for deer and turkey. They also take out the eggs and sometimes the young of ground-nesting songbirds, quail and turkey. Kelly said he noticed that after the pigs moved onto his property four or five years ago the deer and turkey, which had been abundant, disappeared. The pigs rooting through the forest also cause the siltation of streams, harming fish, mussels and other wildlife, Soard said. Another concern is disease. Wild hogs carry over 45 diseases and parasites, Soard said, including pseudorabies, a which can infect pets and wildlife and swine brucellosis, which can also infect livestock but also humans. “Probably the biggest concern would be that if we ever got a foreign disease, like foot and mouth disease that has been eradicated in the U. S., into the wild pig stock; it would take billions of dollars to get it back out,” Soard said. Kentucky has an open hunting season on wild pigs, Soard said, but that is part of the problem, not the cure. In fact, hunting makes the situation worse, he said. Not only was it hunters who spread the pigs around in the first place, their hunting makes the herd “smarter” and more difficult to catch. Soard said the state of Kansas has had success reducing the population of wild pigs by eliminating its open hunting season while still allowing landowners to kill the pigs and trap the animals. “It is counterintuitive to most people that eliminating hunting would help reduce the herd, but they have shown in Kansas that it works,” Soard said. The department has hired a technician in western Kentucky whose job is to monitor and help control the size of the herd in that part of the state. He uses trip cameras to locate herds, which are sometimes attacked by aerial gunning. But the weapon of choice for controlling the wild pig population has been corral trapping, Soard said, because they take out the reproductive units of the herd – sows and piglets. The department sets up corrals made of cattle panels secured to fence posts with a trap door. 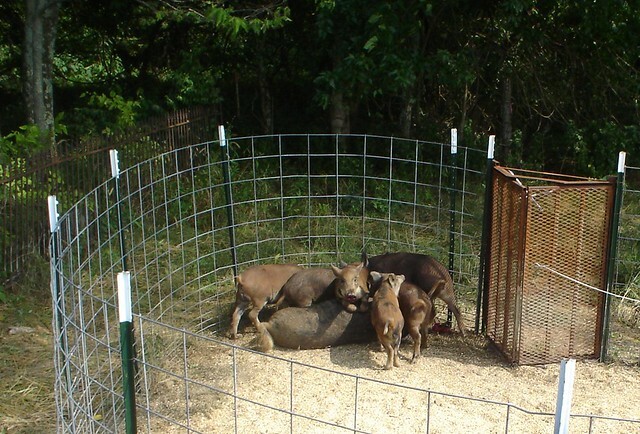 The corral is baited and once the hogs get used to eating inside, the door is sprung and groups of animals are trapped and destroyed. The department has used cost-share dollars to help farmers set up traps on their land. Wolford said he has had two traps set up on his farm in southern Kentucky, one with state cost-share dollars and another with USDA assistance. Wolford said the traps have taken at least 10 pigs out of circulation, but another four or five have escaped the enclosures. Soard said the traps have been effective in reducing the size of the population in western Kentucky, and he hopes that the beasts can eventually be eradicated from the state. “Because our population is smaller and more isolated than those in other southeastern states, there’s a chance they can be eliminated,” Soard said.